We live in an era of discovery, especially as it relates to the microbiome and how microbial diversity influences our world, our health--and even our pet’s health. AnimalBiome is pushing scientific exploration to new levels in the world of cat and dog health. Now, with the help of one of the internet’s most famous cats, AnimalBiome is working to uncover new bacterial species in the most unusual of places—cat poop. 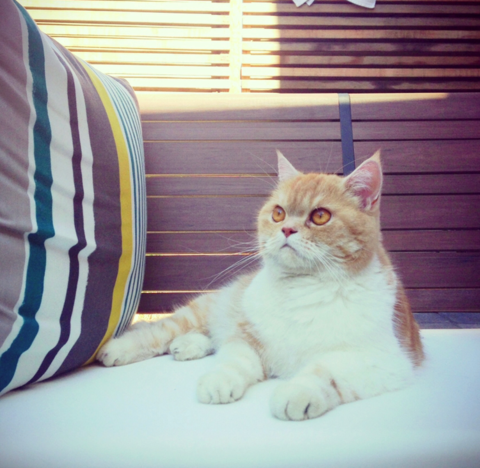 Thanks to a recent collaboration between Phase Genomics, AnimalBiome, and KittyBiome, Lil BUB helped to discover 22 new microbes living in cats. This discovery could in time reveal new insights into cat health and happiness. When KittyBiome started back in 2015 with an intent to understand the cat microbiome, internet celebrity cat Lil BUB was game to participate. Her Dude provided a sample of her poop to be analyzed, and today, thanks to Lil BUB and the other pawticipants in the KittyBiome Project, we began to characterize variation in the composition of gut bacteria associated with healthy cats. As a result, today AnimalBiome is building on this knowledge to help cats with chronic digestive issues and other ailments associated with the microbiome. Late last year, Phase Genomics offered to analyze the samples we got from Lil BUB and another cat, Danny (belonging to Jennifer Gardy—a microbiologist at the University of British Columbia), using the ProxiMeta™ Hi-C Metagenomic Deconvolution platform to obtain complete microbial genomes from our samples. This method solves a huge problem in microbiome research—how to tell apart different species when their DNA is all mixed up in one sample (imagine a thousand jigsaw puzzles mixed together). While AnimalBiome’s approach takes a census of the diverse bacterial populations within our pets’ guts, partnering with Phase Genomics allowed us to take our research a step further by diving into the whole genomes of bacteria within those microbiomes. After performing ProxiMeta Hi-C, Lil BUB and Danny’s poop revealed about two hundred different species of microorganisms, many of which have never been seen before. The genome sequences of the microorganisms found in these samples were analyzed using Phase Genomic’s software and other microbiome analysis tools to detect the quality of the different assembled genomes and to see if these genomes matched any known microbes (the data is available here). Without using the ProxiMeta Hi-C platform to extract these genomes, many of them would have been undetectable and gone unseen. And what we found is pretty remarkable. Together, Lil BUB and her buddy Danny carry 22 previously undescribed bacterial species in their guts. Lil BUB’s poop sample had 13 species and Danny’s sample had nine species that have never before been fully sequenced or characterized. Review Lil BUB’s results here and Danny’s results here. These new bacterial species mostly belong to the order Clostridiales, and the team is currently analyzing the genomes to better characterize them. This discovery will help us continue to build a database that contains cat (and dog) bacteria that are new to science, so we can better identify the contributions of the microbiome to various health conditions. This cool discovery, made with the help of Lil BUB and Danny, highlights that there’s a universe of undiscovered microbial life out there. If we found 22 potentially novel species in only two cats, just imagine what else is out there, and what the implications might be for new ways to support and improve the health of our pets. Who Are Our Hero Cats? 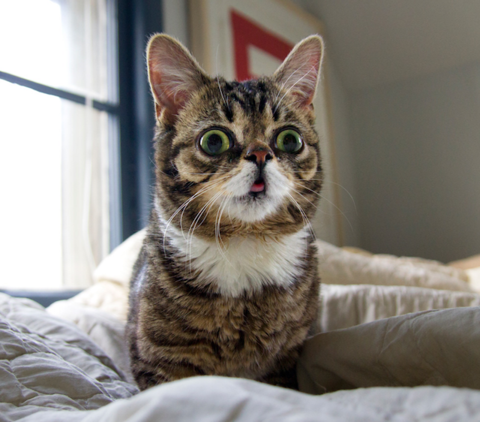 Lil BUB is a one of a kind critter, made famous on the Internet due to her adorable genetic anomalies. She is a "perma-kitten", which means she will stay kitten-sized and maintain kitten-like features her entire life. She has an extreme case of dwarfism, which means her limbs are disproportionately small relative to the rest of her body. Her lower jaw is significantly shorter than her upper jaw, and her teeth never grew in so her tongue is always hanging out. Lil BUB is also a polydactyl cat, meaning she has extra toes - 22 toes total! Lil BUB and Her Dude travel all over the country raising hundreds of thousands of dollars for animals in need. 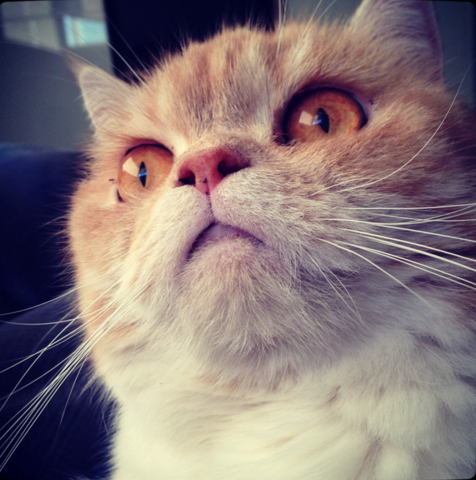 Danny, an exotic shorthair with an expression to rival Grumpy Cat, is equally adorable. 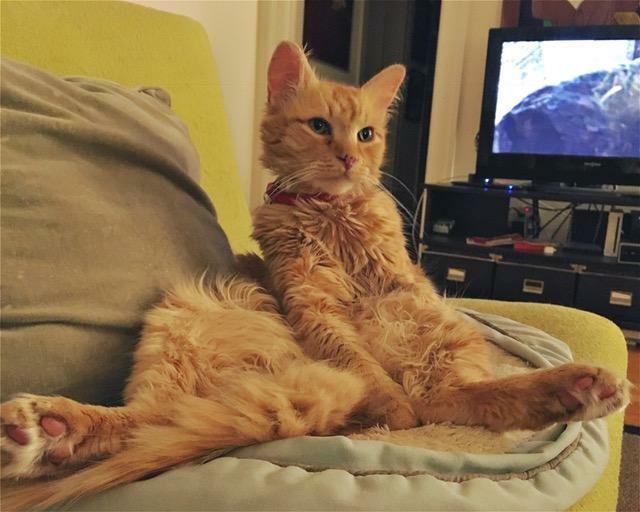 He is the companion cat of one of AnimalBiome’s scientific advisors, Jennifer Gardy, and was one of the very first cats to lend his poop profile to the KittyBiome project. He is a very healthy cat and his microbial profile has helped us learn what a balanced gut looks like in cats. Our next step at AnimalBiome is to learn more about these newly-discovered bacterial species. We will work with the scientific community to analyze, identify, characterize and publish these genomes, starting with exploring their identities based on 16S rRNA and other marker genes. 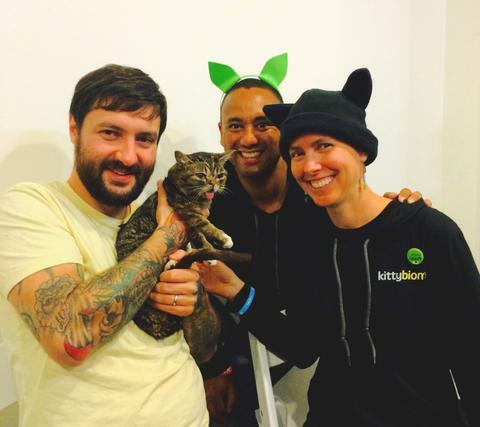 AnimalBiome founder, Holly Ganz and advisor, Carlton Osborne met Lil Bub and her dude at CatCon. 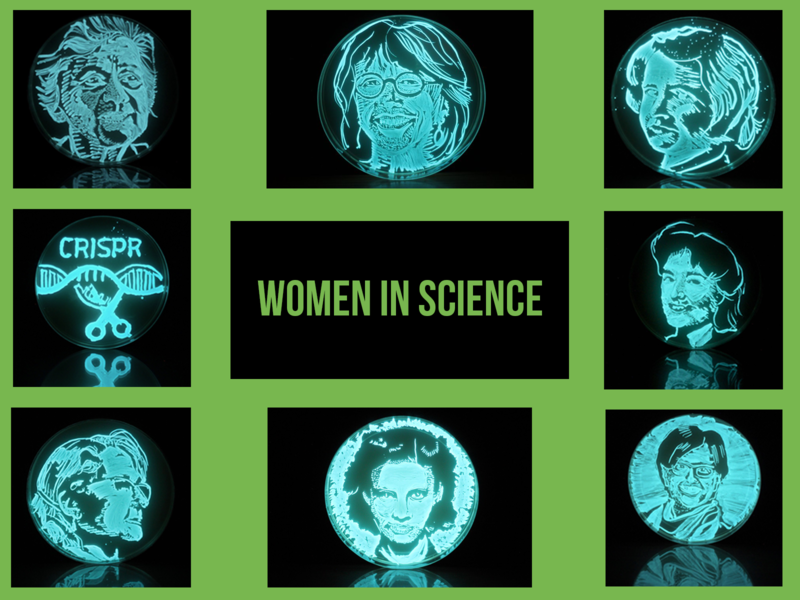 Help us characterize the new bacteria: If you know of a researcher, scientist or cat-lover who would like to help us, we are soliciting input on the analysis that needs to be done to properly characterize and publish these genomes. Participants who contribute in a substantive manner to the project will be co-authors on the publication. 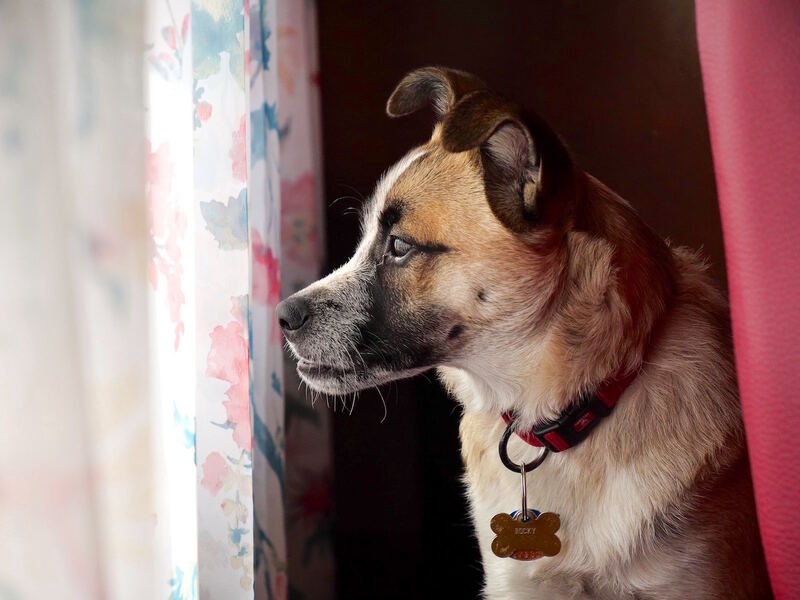 All data associated with the project will be deposited into publicly available databases and we will publish the findings in open access journals, so all pet lovers can read them. If interested, contact us at team@animalbiome to learn more. Find out what your pet’s microbiome looks like: If you’re interested in having your cat’s microbiome assessed to see how your cat’s gut compares to healthy cats, you can order a Kitty Kit - Microbiome Testing for Cats (or a Doggy Kit - Microbiome Testing for Dogs). Submit your pet’s sample for genomic research: If you don’t win the raffle and still want your pet to contribute to scientific knowledge through the identification of new bacterial species, please contact us at team@animalbiome.com. We can provide you with the details and pricing involved for us to identify new species in your cat or dog through in depth analyses like we did for Lil BUB and Danny using the Hi-C approach pioneered by Phase Genomics, which would also result in a publication. Improving databases of the microbiome of cats (and dogs) with new bacteria like this could help us learn more about how the gut microbiome helps support the digestive health of all pets. Phase Genomics, AnimalBiome and KittyBiome are hosting a twitter raffle where you can enter to sequence your cat’s microbiome! All you have to do is go to either the Phase Genomics’ or AnimalBiome original tweet of this blog, retweet it with a picture and introduction of your cat with the hashtag #Meowcrobiome. On August 8th 2018, we will randomly draw one (1) winner whose cat poop will be scientifically analyzed by Phase Genomics with ProxiMeta Hi-C to search for novel microbes, and three (3) additional winners whose cat will receive a Kitty Kit to have their cat’s poop analyzed by AnimalBiome to compare their cat’s gut microbiome to other healthy cats. Send in your cat’s poop, and you too can help discover new microbial life! For raffle terms and conditions visit Phase Genomics.